Food is ephemeral art — the act of appreciating it destroys it. So I feel like it should always be fun. Fusion gets you to fun fast. When you think of the word “fusion,” you probably think of Mexican sushi rolls or other combinations of East-meets-West cuisine. But North-meets-South can be super fun, too. It’s a pretty natural thing for me to do, being from Mississippi and living in Minnesota. 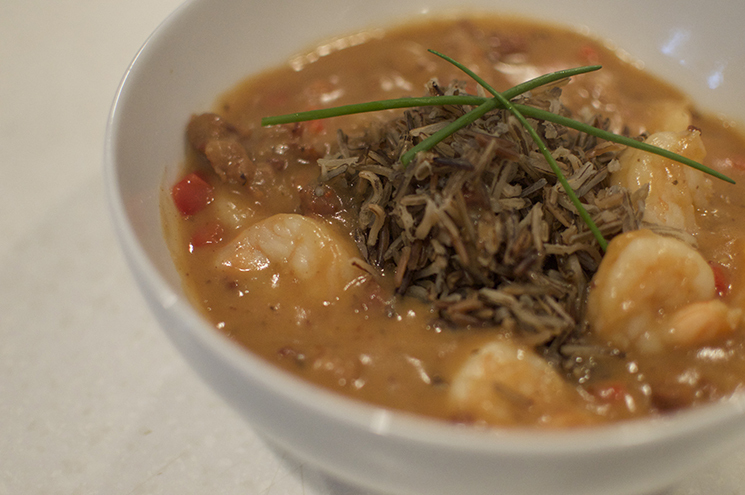 So this recipe for Minnesota Gumbo seemed pretty obvious. Instead of the normal Cajun sausage and white rice, I subbed in bratwurst and wild rice. Wild rice was the ultimate inspiration here. The specific texture adds so much to the finished dish, while also just screaming “Minnesota.” I started the wild rice in the rice cooker. 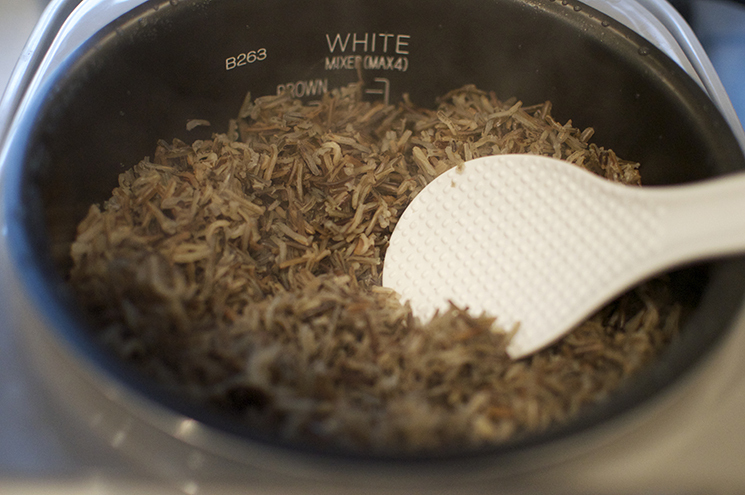 Yes, you can cook wild rice in the rice cooker, on the brown rice setting, at a ratio of 1:1 1/2, wild rice:water. Brats. I’d never had one before I moved to the Great White North. Folks here are nuts for ’em. I enjoy them too, and they seemed like a great Minnesotan alternative to the smoked southern sausages that have a leading role in gumbo. 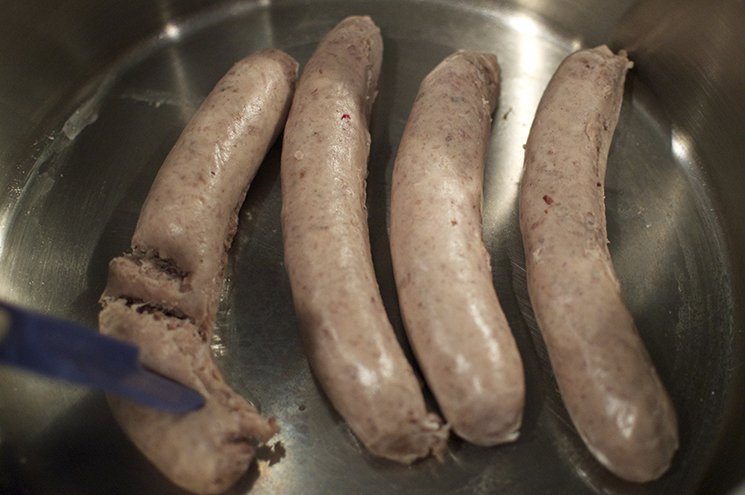 I stripped them of their casings and broke them up in an ungreased stock pot set over medium-high heat, until browned. 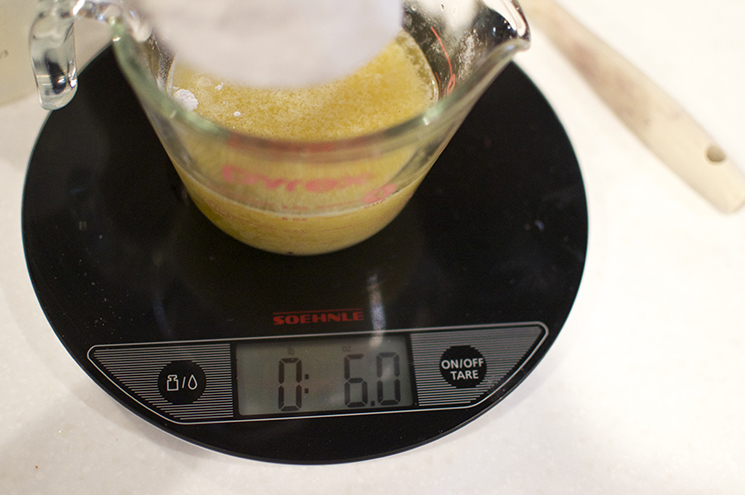 Then I transferred the sausage to a paper-towel lined bowl and poured the rendered fat into a measuring cup. I added enough butter to bring the fat to 6 ounces, then added an equal amount of flour, by weight. 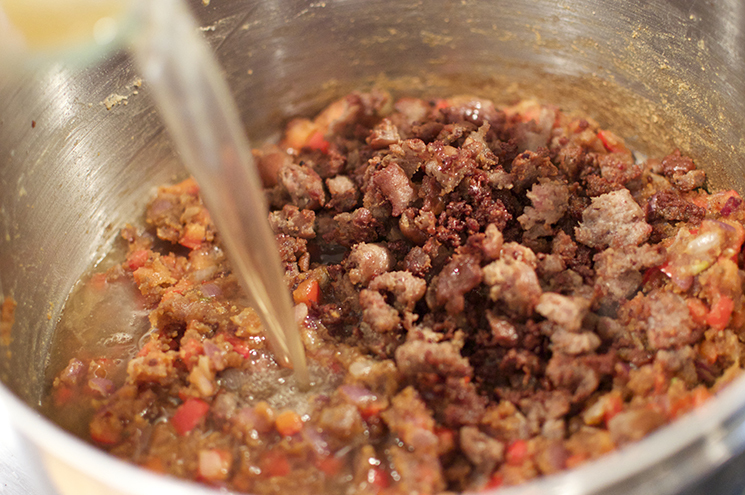 This is the base of our roux, which is a thickener made of fat and flour. 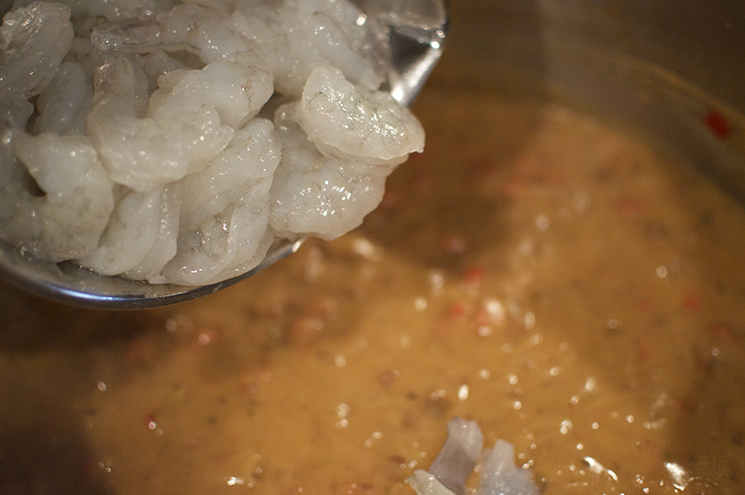 Most Cajun and Creole recipes call for a dark roux, which is 2 parts fat to 3 parts flour, and much darker than I like. The longer you cook the roux, the deeper the flavor — but the weaker the thickening ability. I’d rather use less flour and cook to the brown stage. So I do a 1:1 fat to flour ratio. I cooked the roux over medium heat, stirring constantly, until it reached the consistency of a wet, sandy beach. 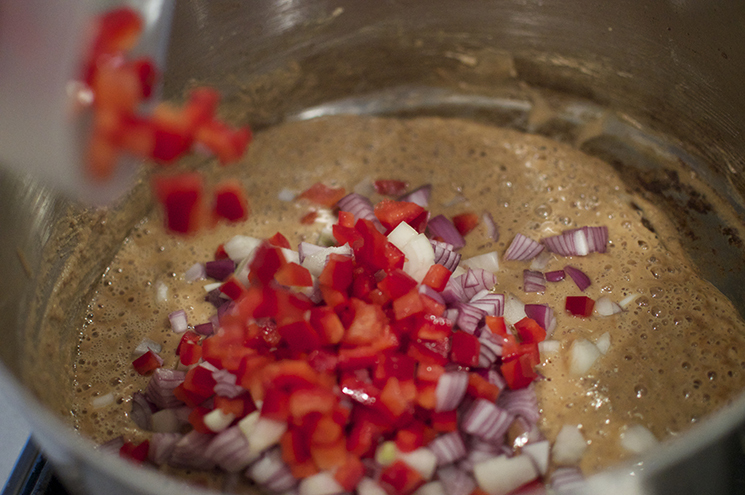 Then I added 2 cups of diced red bell pepper (from 2 peppers) and 2 cups of diced onions (from 2 medium onions). I cooked that about 5 minutes, until the veggies softened. Then I added back the sausage, with a liberal dose of salt and Cajun seasoning, and poured in 6 cups of chicken stock. I brought that to a boil and stirred until thickened, about 5 minutes. Then I reduced heat to low and simmered about 20 minutes, just to let flavors combine and to make sure the taste of the flour had a chance to dissipate and cook out. Then I added a pound of medium shrimp (you could use smaller shrimp if you prefer) and cranked the heat to medium high, stirring constantly until the shrimp were cooked through, about 5 minutes. 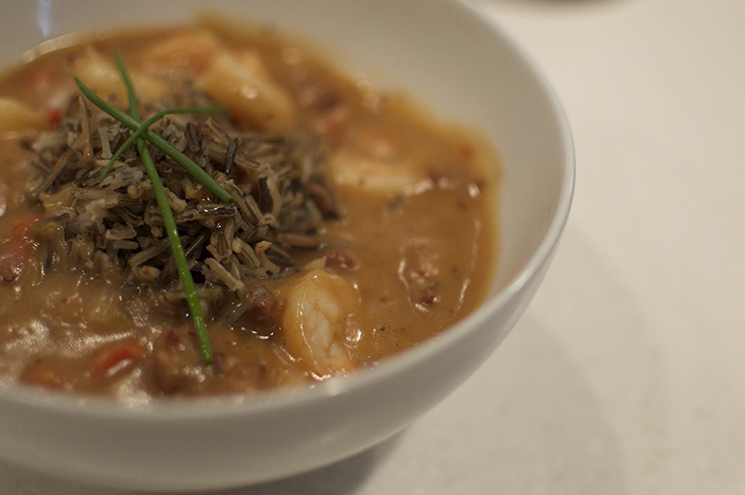 I served it gumbo style of course, with the wild rice mounded in the center of a large bowl and the gumbo spooned around the rice. I garnished with chives, but scallions would be equally appropriate. What I ended up with was a fusion dish that won nostalgia points for the northerners as well as the southerners at our table, while providing interest with the new flavor profile. That’s the beauty of fusion. When it works, it’s simultaneously familiar and refreshing, and it’s the best kind of ephemeral art. Laissez les bons temps rouler? Oh ya, fer sure, you betcha! Yum! Looks delish, and perfect for this cold, rainy weather we have been dealing with!